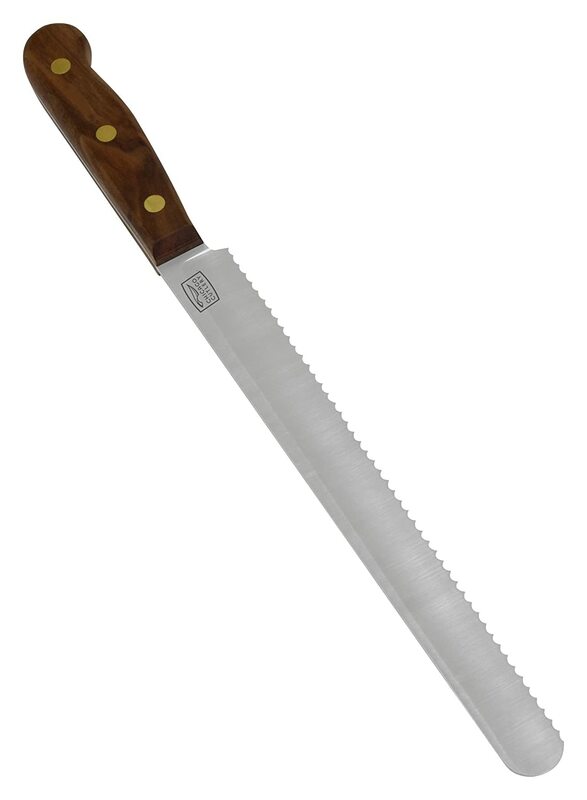 You may be on the fence about purchasing a bread knife. You may be concerned that you don’t buy fresh bread often enough to warrant the purchase of a bread knife.These knives are useful for more than just bread. A bread knife’s extended length and sharp serrated edges are perfect for slicing pineapples, grapefruits and other extra-large, unreasonably soft or easily bruised fruits and veggies. Read on for our guide on how to choose the best bread knife to hone in your kitchen cutlery set. Why do I need a bread knife? My bread comes sliced in the package! If you have ever baked bread, or looked at a bread recipe, then you know basic bread takes four ingredients: flour, water, yeast and salt. That’s it.You shouldn’t need a master’s degree in chemistry to read the label on store-bought bread. (1). It is understandable why bread companies would want to extend the shelf life of their bread. Homemade and artisan breads tend to dry out and grow mold quickly. This is a natural process and a not bad thing. What is bad is to watch a loaf of bread staying perfectly soft and mold-free after being on your countertop for two weeks. Don’t buy pre-sliced, mass produced bread. Instead, visit your local bakery, even if it is your supermarket bakery. Alternatively, consider baking your own bread! How do you slice fresh bread? Delicious artisan and homemade bread is usually soft on the inside with ahard outer crust. Have you ever tried to slice your bread with a straight edged chef knife or steak knife? I have. It is, figuratively speaking, a hot mess! Crumbs go flying all about, the bread ends up crushed on the insides, and piecemeal on the outside. Longer knives may seem cumbersome at first, but they can slice the width of that pretzel boule you've been eyeing at your local bakery. These lengthier knives can help you achieve a nice even layer when trimming the tops of half and full sheet cakes, or large watermelons at your summer BBQ. High carbon stainless steel come in a variety of different alloys and is often used to forge or stamp kitchen blades. (5) Once sharpened these high carbon steel alloys are able to remain sharp for a longer period of time (6). Stainless steel is more resistant to rust than other metals. Additionally, it can be sharpened easily. 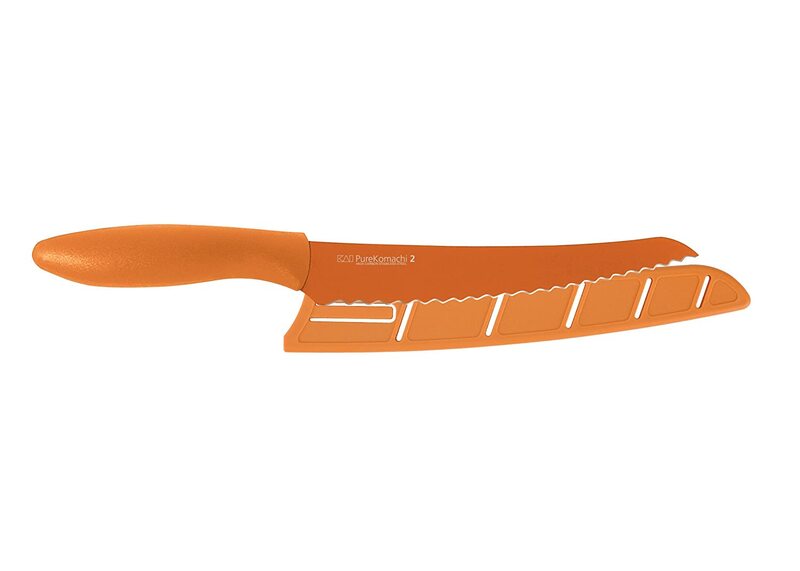 Ceramic blades are giving stainless steel a run for their money lately. This isn’t the fragile ceramic used to make pottery as you may have thought. The ceramic used for knife blades is exceptionally hard, even harder than steel. Ceramic knives are not supposed to need sharpening. There are various types of materials used for making knife handles, from santoprene to plastic, stainless steel, or wood. The material you choose depends on your personal preference. The handle obviously has no effect on the knife’s ability to slice. What's important is the comfort and balance it provides. A well-balanced handle relieves stress on your hand by providing an even weight distribution throughout the knife. Do not place your knife in the dishwasher. This is to prevent the blade from being pummeled and jostled around by the dishwasher’s jet streams into other objects, dulling your blade. Your serrated knife can be hand washed and dried promptly afterwards. 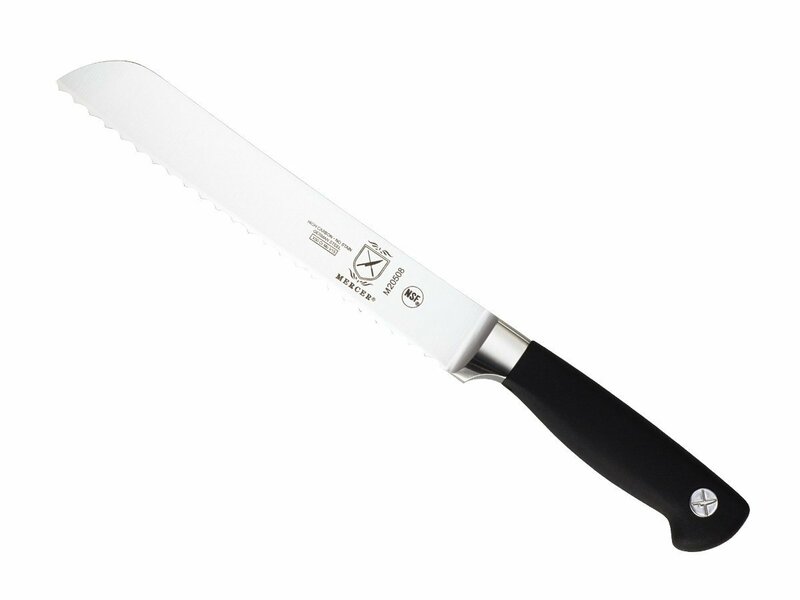 When you need your bread knife sharpened, take it to a butcher or professional knife sharpener. Do not attempt to sharpen it with a conventional sharpener, as serrated edged knives only need honing to remove burrs from their scalloped edges every once in a blue moon. So you have explored why you might want a bread knife, what to look for in one, and how to care for it once you take it home. Now I'm walking you through the top five bread knives that I found worth considering. 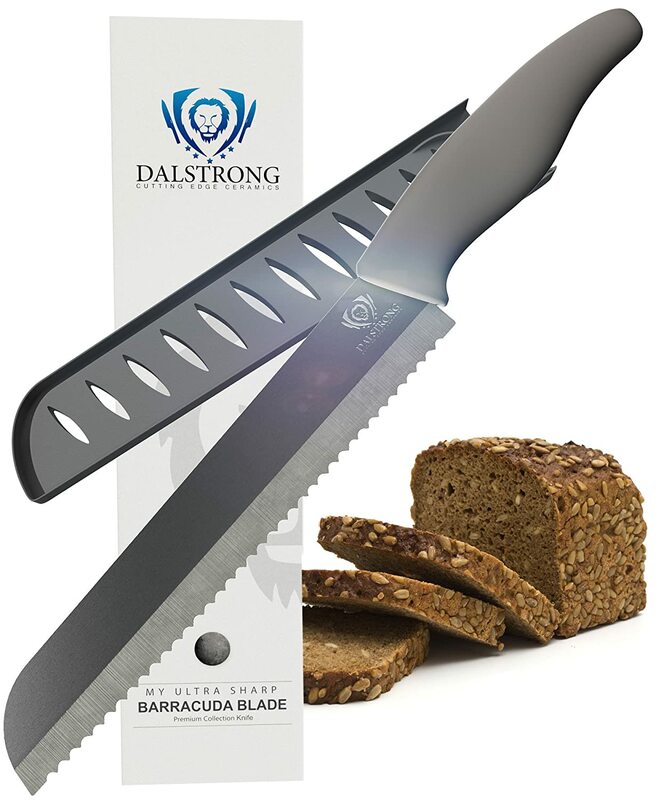 DALSTRONG Bread Knife - Barracuda Blade - Serrated Ceramic - 8"
Manufactured in a state-of-the-art facility within the ancient Chinese city of Chongqing, using German technology and Japanese ceramic sharpening processes. After carefully reviewing these top five bread knives, I have to say that my favorite pick out of this lineup is the Victorinox Swiss Army 10.25 Inch Fibrox Pro. Even though it is on the more expensive side of the list I like that the blade is 10.25” long. It can be useful for cutting sourdough as well as trimming up large half sheet cakes. The lightweight feel of this knife as well the nice balance between handle and blade may put this pick ahead of all the others. Now, is up to you. The slice is in your hands. 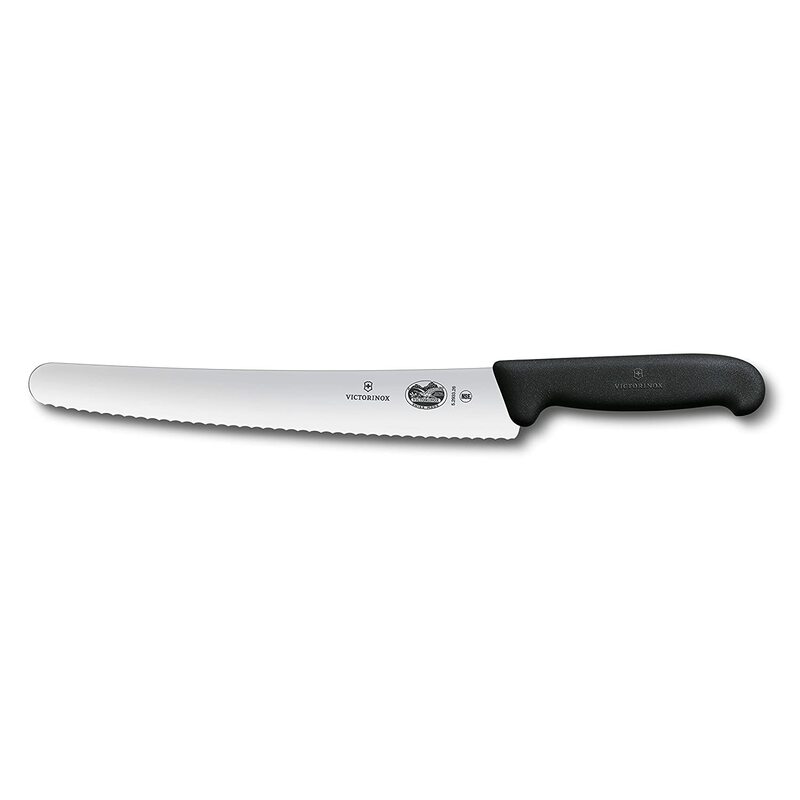 Hopefully this guide has helped you to find the best bread knife for your needs.